The eastern portion of the hilltop village of Stainland, above Elland, is known as Holywell Green, on account of St. Helen’s Well, a renown healing well the sad remnants of which can be seen beside Station Road. The well stood near a former Catholic chapel also dedicated to St. Helen, which by the 18th Century had been converted into a private dwelling, although a carved cross was still built into its walls. In 1597, a charity inquiry recorded “St. Ellen Chapel, Stainland” as already “decayed”, suggesting it was probably abandoned during the Reformation earlier that century. 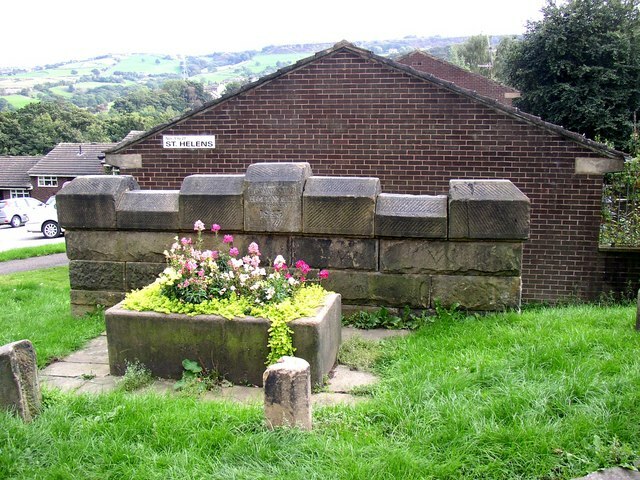 The well itself was first recorded in print by Dr. John Watson in his 1775 work “The History and Antiquities of the Parish of Halifax”, in which he also mentions record of a Henry de Sacro Fonte de Staynland (Henry of the Sacred Well of Stainland) living in the area in the 13th Century. It is likely that the chapel was dedicated for the well, rather than the other way round as St. Helen was a popular patron of holy wells in Britain, and seems to have been imposed on those wells which already had a reputation for sanctity long before the coming of Christianity. The exact traditions of the well have been lost, although Watson records that Catholics were still making pilgrimages to it in the late 18th Century. The Victorian fashion for spa-waters saw a resurgence in the popularity of the well, when crowds would gather at such springs on the morning of Spaw Sunday (the first Sunday of May) to “take the waters” for therapeutic purposes. As a result of this revival, a spring beside Station Road was restored in 1843, although a late 19th Century woodcut shows that by that period it had once more been left to fall into ruin. Today, this well is something of a pitiful prospect. Whilst it was again restored in 1977 and still stands today, the spring itself has long since dried up due to building work in the area lowering the water table. It is now little more than a trough used for flowers, whilst the views it once commanded across the valley have been disfigured by an ugly estate of modern bungalows. A hostelry named Holy Well Inn still stands nearby. Curiously, however, there is no historical basis for the original holy well at the extant 1843 site, despite the name of this part of the village. Local antiquarian J.A. Heginbottom argues that the original site is more likely to have been just over half a mile away at Helen Hill Farm on Jagger Green Lane in the valley below. Here, there is a stone cistern with three compartments dating from approximately the late 18th Century, still fed by a spring rising nearby.